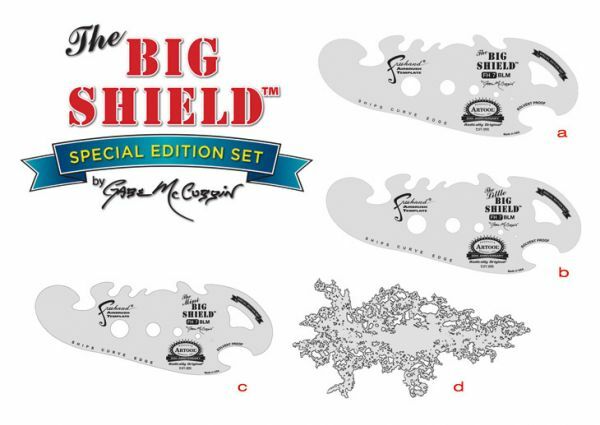 Always attention to detail, technical skills, passion in our work and great attention to customer needs are the strengths that have allowed us to excel in the field of sale of 4 Stencil Artool Freehand Airbrush Templates FH 7 THE BIG SHIELD SPECIAL EDITION. Consultando il catalogo di Aerografando you will immediately notice how vast it is and how diversified the model range is Artool, you will find the best 4 Stencil Artool Freehand Airbrush Templates FH 7 THE BIG SHIELD SPECIAL EDITION offers at the best prices on all 4 Stencil Artool Freehand Airbrush Templates FH 7 THE BIG SHIELD SPECIAL EDITION of the brands Artool. Delineate shapes by matching the contours of the Freehand Airbrush Templates with the subject matter. This greatly reduces all the time and energy spent cutting frisket or acetate masks. Rotate or flip-flop the Freehand Airbrush Templates to find the shape that works best. Combine different sections to create desidered shapes or combine two different Freehand Templates in various ways to create even more possibilities in your work. Raise Freehand Airbrush Templates slightly to create soft edges. Easy to use with bater-based and solvent-based paints. Clean us is a snap. Simply wipe off with appropriate cleaner or solvent and you have a new template. Read the reviews of our customers on 4 Stencil Artool Freehand Airbrush Templates FH 7 THE BIG SHIELD SPECIAL EDITION of the category Artool. Review 4 Stencil Artool Freehand Airbrush Templates FH 7 THE BIG SHIELD SPECIAL EDITION of the brand Artool. Trust in the quality and professionalism of Aerografando on the sale of 4 Stencil Artool Freehand Airbrush Templates FH 7 THE BIG SHIELD SPECIAL EDITION, only from us you will find the best prices. You want to have more details on 4 Stencil Artool Freehand Airbrush Templates FH 7 THE BIG SHIELD SPECIAL EDITION FH7BLM or more generally on ours Artool? You are looking for a Artool but do not you find it in the catalog? Staff of Aerografando will answer all your requests.